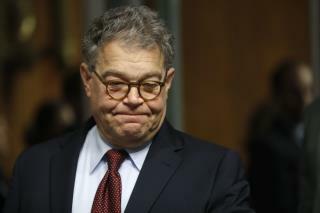 (Newser) – Not too long ago, reporters were pestering Al Franken about whether he would run for president in 2020. Now the question is, will he resign from the Senate? "No," a staffer tells the Minneapolis Star-Tribune. "He is spending time with his family in Washington, D.C., and will be through the Thanksgiving holiday, and he’s doing a lot of reflecting," the aide texted. Meanwhile, Franken is suffering another bit of fallout in the wake of a 2006 photo that emerged of him posing with his hands just above a sleeping woman's breasts: PBS is largely editing him out of a PBS special honoring David Letterman, reports USA Today. pbs? that gotta hurt when they do that to you. &Staffer says he is not resigning after that Photo he should resign immediately Picture says a thousand words. Sad. Al is one of the few intelligent members of the Senate. 'Whipsaw' is not a reach in describing my reactions to this story I'm a big critic of PBS as it has become a Liberal shill, IMO. Initially touted as the 'fair and balanced' alternative to a (conservative) tilted news world in America but soon dedicated to hypocrisy as the 'voice of the unheard' when they turned on Franken I thought, 'Look out Al ... 'Heah come de bus!'. On reflection it is wholly appropriate that Mr. Franken's troubles should not shadow Mr. Letterman's moment in the limelight. Then it hit me, Letterman ? Now there is a shameless anti-American Liberal Lame if ever was one.